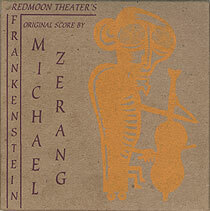 This disc features the original sound score by Michael Zerang for Redmoon Theater's production of Frankenstein, featuring Shelley Wiess, viola; Fred Lonberg-Holm, cello; Noel, Kupersmith, bass. Recorded at Airwave Studios, Chicago except tracks 2, 6, 11, 24, 26 recorded at Double Wide Noise Studio. No recording date given but the work was premiered at the Steppenwolf Studio Theater, Chicago in March 1996. Cover art (front cover reproduced above) by Charise Mericle.